This salad is so simple anyone can make this corn and black bean salad. Canned corn, black beans, and a few fresh veggies will make up a hearty salad that makes a perfect side dish, or even as chilled burrito filling. 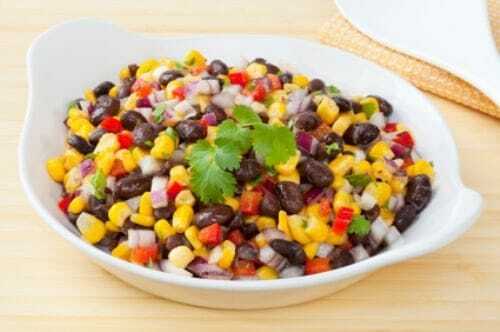 You can make Corn and Black Bean Salad, it is a filling and satisfying side salad. Combine all ingredients. Let flavors marry at room temperature, for up to an hour, or cover and refrigerate overnight. What are your thoughts of adding roasted red peppers? I made this tonight & it is wonderful. The recipe didn’t call for any onion, but I chopped up half of a red onion & it was added another level to the taste.